I love the idea of marking out on a map all the places we've been. Above you can see a couple of inspiring ideas from Inside Out magazine (new issue just out). 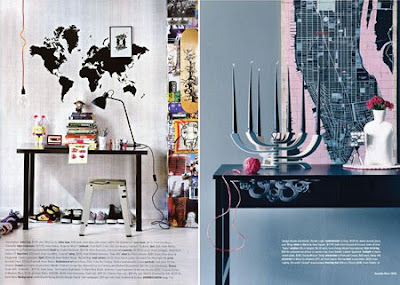 You could have lots of fun with the world map wall sticker from Ferm Living. I also like the idea of marking out trips on the cushions with buttons for each major city visited. I'd have to have a cushion just for Europe I think though.